The head of the Communist Party of Vietnam (CPV) Central Committee’s Commission on Mass Mobilisation, Truong Thi Mai received General Secretary of the Confederation of Cuban Workers Ulises Guilarte Nacimiento in Hanoi on July 6. The Vietnamese Party official affirmed the CPV’s and Vietnamese State’s support for the process of updating the socio-economic development model in Cuba. She informed the guest on the major outcomes of the seventh conference of the CPV Central Committee and praised the long-standing friendship and solidarity between Vietnamese and Cuban trade unions. 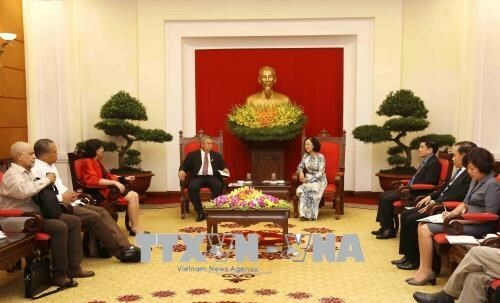 Mai told her guest that Vietnam will always stand shoulder to shoulder with Cuban people to elevate bilateral ties to a higher level in the time ahead. Nacimiento briefed Mai on the process of revising the Constitution and updating Cuba’s socio-economic model, saying he wishes that political ties and economic-trade links between the two nations would grow further in future.